Rick Fernandez helped his client sell Dupont Circle’s well-known Starbucks building for a record setting price. Photo by Joanne S. Lawton. Dupont Circle’s well-known Starbucks building, owned by Robb LaKritz, sold to Harbor Group International for a record-setting price. There was no hungry giant or sky-high beanstalk, but at perhaps the busiest corner of Dupont Circle, a few roasted beans did indeed lead to some serious, serious green. 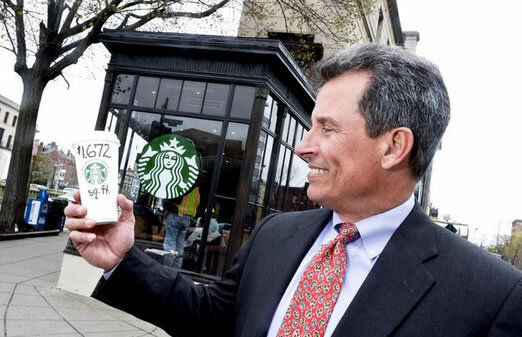 After buying it in 2010, Lakritz-Adler sold off what’s been widely dubbed the Dupont Circle Starbucks Building, named for its flagship tenant, the East Coast’s first purveyor of the now omnipresent Seattle-based coffee brand. The sale price, to Norfolk, Virginia-based Harbor Group International, was a staggering $16.25 million for the 9,718-square-foot, fully leased buildings at 1501-1503 Connecticut Ave. NW. Or $1,672 per square foot, a retail sales record for triple net lease investment properties in the District. Or, in yet another per-square-foot metric, 886 tall cups of Starbucks joe. Despite the milestone, brokers say the sale price wasn’t much of a surprise. Calkain Cos., hired the previous fall to market the property, had already garnered a then-high $1,200-some-per-square-foot price on a previous retail sales deal. It plunked the adjoining pair of Connecticut Avenue buildings on the sales block at an asking price of $17.5 million, or $1,800 per square foot. Presumably, Harbor Group can enjoy that foot traffic for quite a while. Starbucks, which leases 3,736 square feet in the property, more than a third of its total space spanning the basement, first and second floors, has signed a lease there through February 2035. Its $79.31-per-square-foot rental rate brings in nearly $300,000 annually on its own. Even beyond the java, among the building’s other tenants, the closest lease expiration date is for custom men’s suiting retailer Alton-Lane, up for renewal in August 2016. The remaining neighbors — bead shop Beadazzled, BBB Fresh Pan-Asian cafe and office mate Reishman Real Estate, the second-largest tenant at 3,195 square feet — are tied to leases that stretch to anywhere from 2018 to 2021. Net lease properties are those in which tenants pay their own management, utilities and insurance. Having multiple retail tenants in such properties is common, but having office tenants is not. In addition to event space that Lakritz- Adler held on the fourth floor and roof terrace, the property’s residents yielded $744,051 in total rent income a year, with promises of 3 percent to 10 percent annual increases going forward. The cap rate was 4.3 percent. Be it real estate or relationships, long term is a plus. “The investors were looking for stability of the income stream the property affords,” Fernandez said. The outcome proved quite profitable for Lakritz-Adler, which Fernandez said had originally intended to hold onto the buildings, one 107 years old and the other a sprightly 92, for longer than four years. That is, until the District’s investment sales market started to turn by the end of the Great Recession. Indeed, Calkain had canvassed the globe for potential investors, attracting groups from California, New York, even South America. It touted the site’s recent $3.7 million in landlord and tenant renovations and total net operating income just shy of $700,000. But the sticker shock was still too much for some shoppers. “Interest was still definitely strong, but because of the seller’s requirement to do the deal, we had to really push hard to get the numbers they wanted,” Fernandez said. And that asking price, Fernandez said, was meant to send a very specific message: Show up or go home. Seller rep: Rick Fernandez and David Sobelman, Calkain Cos.